The minimum tools a blacksmith needs are anvil, hammer and forge. Followed by tongs, punches and chisels (all of which can be made by the smith). The forge is perhaps the most variable of the smiths tools. It can be fueled by a wide range of fuels and come in many configurations. Its task is simple, to produce a sufficiently high temperature and in sufficient capacity to make metal (iron or steel) plastic or even melt it. 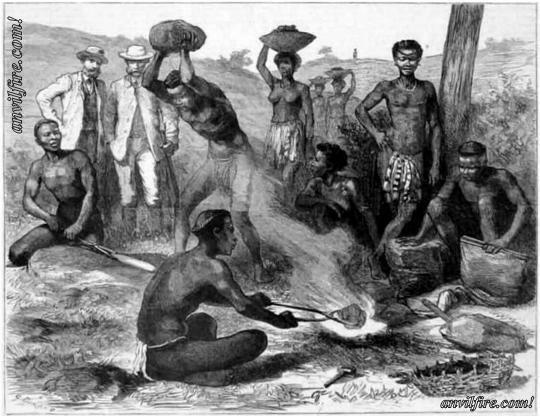 In practice a forge is a container to hold fuel while air is blown into the fire. A good forge helps focus the fire to make a hot spot efficiently and support the work in the fire. The engraved scene above was recorded in 1879 and published in a British geography magazine. It was also filmed in 1936-37 with native blacksmiths playing their parts reproducing every detail almost exactly as above for the movie King Solomon's Mine. They are using a stone anvil and two handed stone hammer exactly as above. The fuel is wood charcoal (carbone'). In the movie the smiths are using wooden tweezer type tongs to manipulate the hot iron rather than iron tongs shown above. These were two pieces of wood with a leather hinge tacked to the far ends. Such tools would be expected when iron was too valuable to make hammer or anvils. It is also possible to make them with the most primitive stone tools. Video of Zulu blacksmiths forging iron on stone anvil with stone hammer. Pit forges were shallow clay lined pits dug in the ground with a stone lined or ceramic tube tuyere (air tunnel). These have been in use for thousands of years and are still in use today. Where potteries were well established the tuyere for all kinds of furnaces was a series of tapered ceramic tubes that fit into one and other. Otherwise stone and clay would do. All that is needed is a way to prevent the tuyere, the air tunnel, from collapsing. The need for a clay forge lining depends on the soil conditions. Loamy soils with lots of organic material would crumble or burn thus the pit would not hold its shape. Sandy soils would also collapse. Clay would be obtained from local clay banks. Additions such as lime or manure were used to help bind the clay according to local custom. Traditionaly the blast was produced by a hide covered pit, wine skins or fabricated bellows. These forges are still used in primitive or impoverised places. Modern versions may use an iron pipe for the tuyere and a hand crank or electric blower according to the means of the smith. 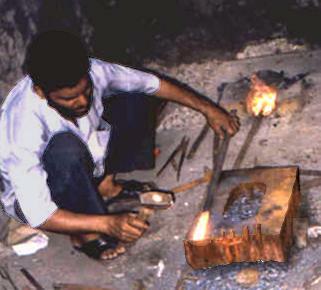 Above, Indian blacksmith working with pit forge. CJ Roy of Bison Forge New Deli, India says, "Here in India we simply dig a hole in the ground insert a grate and prop a few old bricks around the hole and insert a simple mechanical or motorised air-blower in a trench leading into the hole under the grate... seal all airgaps- then a bit of kindling is lit up and allowed to smoulder then we sprinkle a few handfuls of coal granules onto the embers start up the blower and we have a nice forge running in a few minutes!! No hunting around for any mechanical parts or materials.. if the forge is permanent then we daub the surface with an indigenous mortar which is primarily some "end-product" of the HOLY COW! and some other clay stuff..."
The Smith and the Monkey: Another story from India was that of an enterprising smith that taught his pet monkey to operate a hand crank blower. Local authorities were acusing him of animal abuse. This, from a place where child labor in near slavery conditions is still common. Knoweledge of this simple pre-historical forge, its construction and operation is part of what all smiths should know. There may be no difference between the twentyfirst century pit forge and those used thousands of years earlier. The Indian blacksmith above has a helper cranking a small blower. But the forge could be powered with wine-skins or a modern electric blower. The results are the same, iron or steel hot enough to bend, shape, punch, twist, cut and weld by hand. The difference in how the blast is produced is largely a matter of efficiency. Using blow pipes might take six or more helpers with replacememts during the day. Using hides over pits takes two people and is back breaking work. Helpers would need to be replaced during the day. Paired bellows can be usd by one helper or even the smith. But in most cases a helper and possibly a replacement was necessary during the day. Double action bellows and hand crank blowers can be operated by the smith but he can be more productive with a helper. These devices are efficient enough that a helper should be able to work them all day. Electric blowers relieve the smith entirely of cranking or pumping as well as the need for a helper for this task. This relatively simple technology reduced the need for helpers from a half dozen to none.